Creating /editing an opportunity stage in Method. 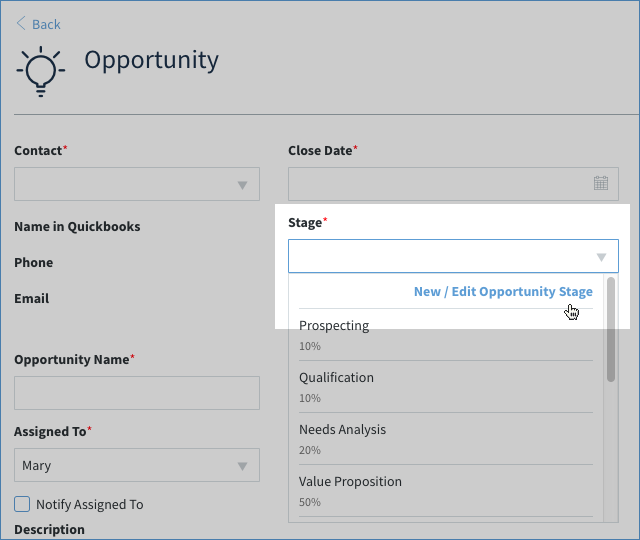 The whole point of Method is to tailor your CRM experience to your business practices, so we’ve included an option to create a new opportunity stage. Note: The add and edit screens are laid out the same way, so we will go through how to create a new stage. You can edit an existing stage by clicking on it and changing the information in the fields. 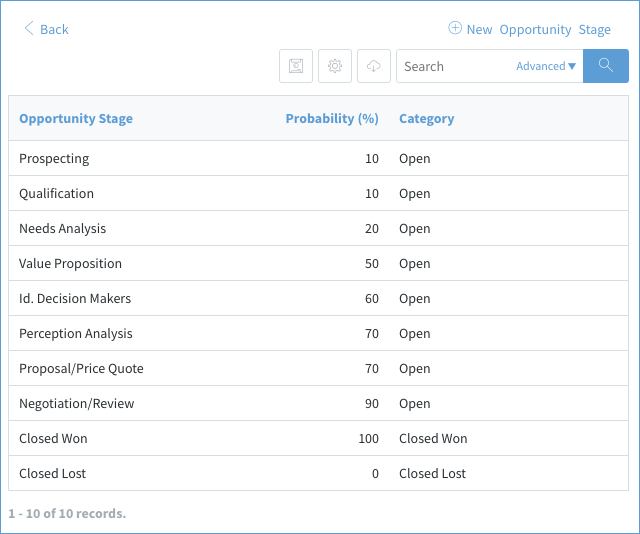 It's a Method best practice not to edit stock options, but you can create your own very easily! 1. 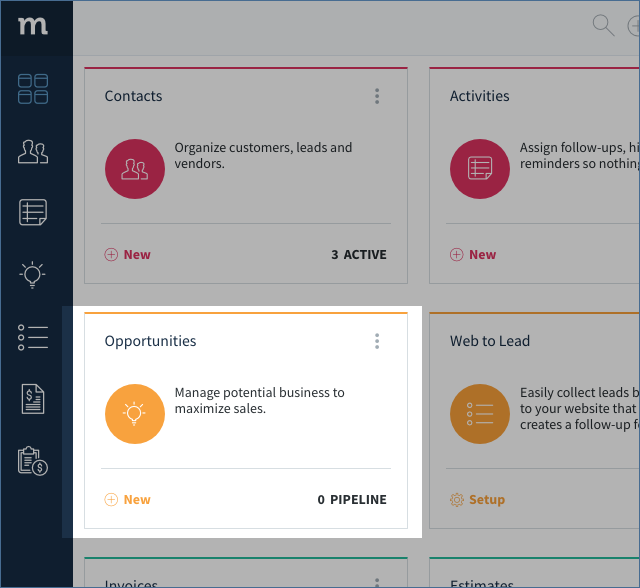 From your Method dashboard click ⊕ New on your Opportunities App. 2. This opens your New Opportunity screen. In the Stage dropdown, click New/Edit Opportunity Stage. 3. This opens the Opportunity Stage List. Click ⊕ New Opportunity Stage. 4. This brings you to the New Opportunity Stage screen. Opportunity Stage* - Choose a unique name that reflects the step in the pipeline this stage best represents (e.g. continuing research). Stage category* - Select a category to which this stage belong: open, closed won, or closed lost. This affects how the opportunity will look in charts and reports. Stage Order - Although not used, this can be utilized in a cutomization if you wish to order the stages. Stage Probabillity Percent -Identify the probability percent you would like this stage to represent. 5. When you're done, click Save & Back. 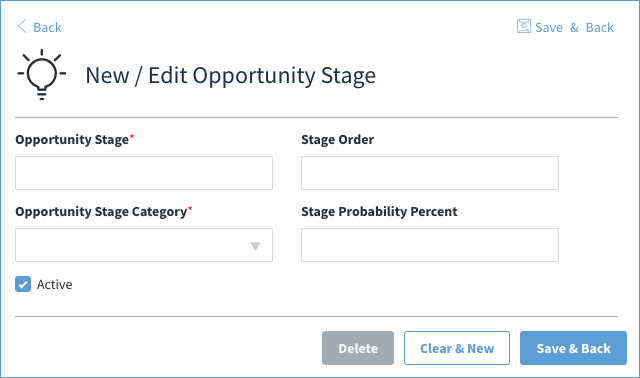 This opportunity stage is now available throughout Method.